No matter what kind of Flyer Templates you're looking for you're bound to find something of interest on this page. Or, you can choose from hundreds of free ones. 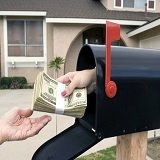 Following are articles and links to free flyers that I'm personally familiar with and/or have used many times over the years. I hope they're as useful to you as they are to me. One - Design Your Own Flyer; Start To Finish in Five Minutes. You can be printing your own flyer in minutes. 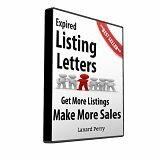 Take a quick look at how you can be generating more buyer and seller leads starting today. Click here to read more about how. Two - Try a FREE Flyer Template. 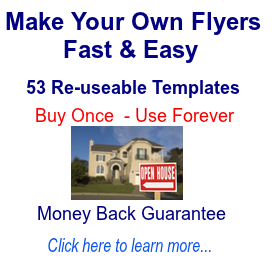 I've used flyers effectively for years to generate leads; specifically, to sell houses, lease option and flip them. And in many instances when I didn't have money to have them professionally printed I designed and printed my own using Microsoft Word Templates. Microsoft's flyer templates aren't necessarily fancy, but they are effective. Click here to read more about it. Three - My Collection. I've used flyers to promote birthday parties, open houses, real estate listings and homes that I've personally owned for lease or sale; and most of the time I started them from templates on my personal, computer as a Microsoft Word Document. My motto was…and still is..."why spend money if I don't have to!" Click here to read more. Four - Free Real Estate Flyer Template. The main thing that a template can do for you is save you time,hassle and frustration, too. And programming and flyer building skills are not needed. Anyone can design their own...even you! Read more here. Five - Easy to Find and Design. This article talks about flyers with tear off tabs; flyers with floor plans, pictures and maps; and apartments for rent. I wrote it nearly a year ago and it has been viewed nearly 4,000 times. Hmmm...it must be good, right? Click here for more. 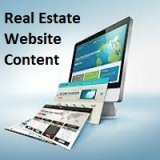 Six - You don't have to spend hundreds of dollars to develop a professional looking real estate flyer. In fact, I've made and distributed thousands of them for free! Want to know how I did it? Click here for more. Last, but certainly not least, is the my Top Recommendation for Real Estate Flyer Software...and that is Turnkey Flyer. Turnkey offers an easy to use interface with simple click and drag and drop technology. It's a great program for anybody wanting to create professional looking flyers with a minimum of time and money invested in doing so. Click here to visit their website. Summarily, "using templates makes sense if you're not a professional illustrator, graphic arts designer, or desk top publisher. With them you can often point and click your way to well designed and visually appealing flyers."